It has been a very eventful weekend in my little apiary! Matillda and half of her hive decided Sunday was a good day to swarm. In the spring it’s common for bee hives to split when they become overcrowded. The worker bees will prepare for this split by raising a new queen. They will choose around a dozen eggs which will be fed Royal Jelly exclusively. This special diet will allow the eggs to grow into fully formed females complete with all the reproductive parts needed to mother a whole colony of bees. It will take 16 days for the queens to mature in their specially built honeycomb cells which are large and look something like a peanut. When the first queen hatches she will start making a piping noise which makes all the other possible queen candidates start piping too. Hearing the un-hatched queens in their cells, the first queen will make her rounds – killing the other queens before they can hatch or fighting to the death of any others that may have hatched before she could get to them. 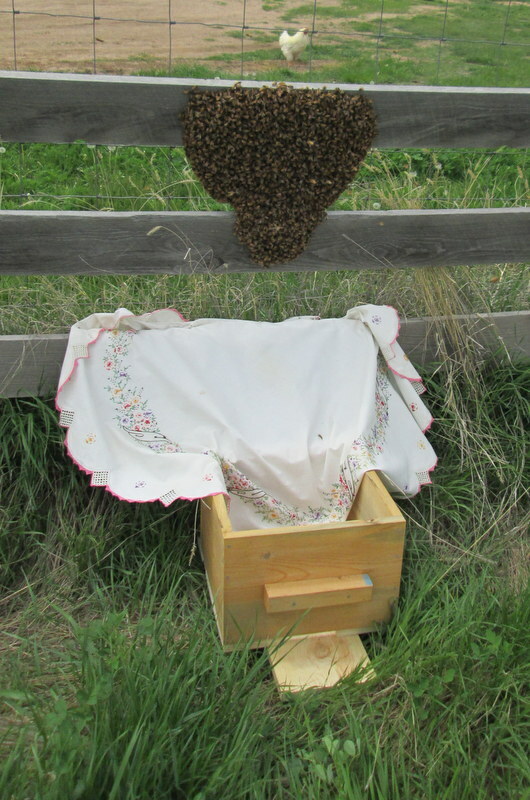 Common belief is that each colony will only have one queen but it appears that is not always the case. Studies have shown hives can have 2 or more queens. Survival of the fittest at its best. But before all the power struggle for the crown starts the old queen (Matillda) and half of the worker bees will just pick up and leave. They will form a cluster or swarm somewhere as the scouts venture out looking for possible nesting sites. I knew this would be a possibility since both the hives had survived the winter so I had split my first hive – Bee-A-Trix and was getting ready to split the 2nd one when the bees got tired of waiting for me. So after a morning spent rooting around in the garden, I was in the process of getting cleaned up to go to a wedding – blissfully ignorant of what was going on outside. At least until I glanced out the window and saw something caught in the fence. I had just stepped out of the shower and didn’t have my glasses on so at first I thought it looked like one of my poor hens hanging upside down in the fence. This type of thing has happened before. Thomas, our turkey tried to fly over the fence one day and somehow managed to get his feet caught in the wire. He was hanging upside down like Thanksgiving dinner ready to pluck when I saw him. I’m not sure how long he had hung there but by the time I found him he was totally exhausted and a little ‘loopier’ than normal. Of course seeing a brown mass caught in the fence – I panicked. Shoving my bare feet into my fuzzy slippers I ran out into the back yard. I’ve said it before, and I’ll say it again – It’s a good thing we don’t live in town! I did mention I had just stepped out of the shower, right? 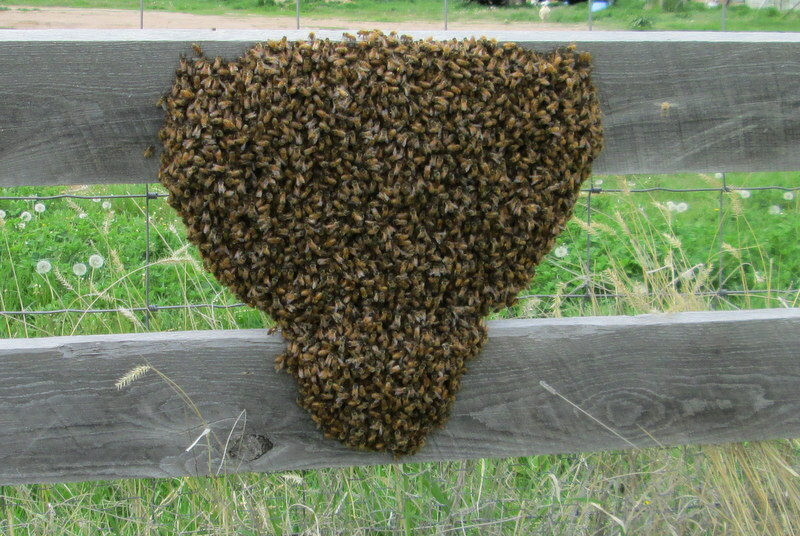 By the time I got close enough to see that it wasn’t a chicken I realized it was a beautiful swarm of honeybees clustered onto the boards and wire of the fence. It was exciting and beautiful!!! I stood there in awe – my jaw slack and agape till I realized I had way too much exposed skin to be dealing with something like this. I high-tailed it back to the house in a mad dash. You should have seen the chaos that ensued – a buck naked blur of glow-in-the dark white ranch wife flesh which hadn’t seen sunlight for the last 8 months of the longest winter in recent history! There was no time to waste. 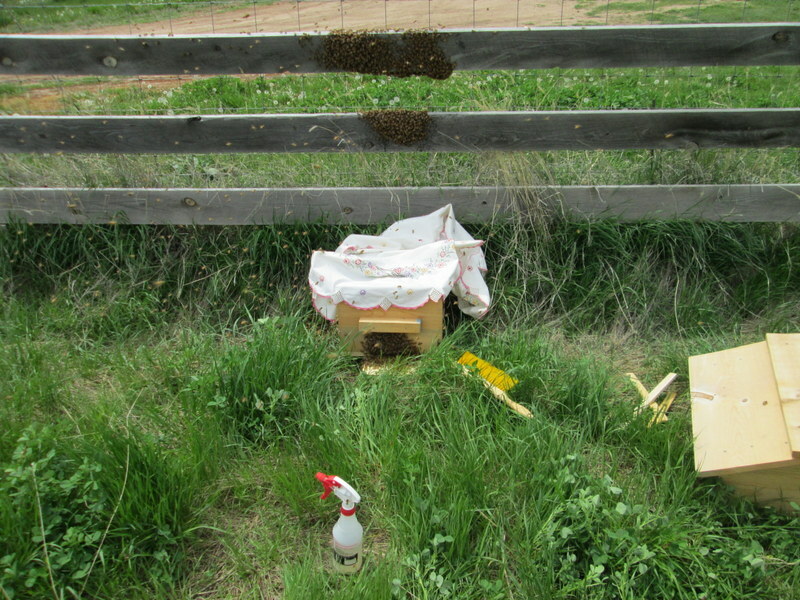 I was throwing on clothes and gathering bee gear as fast as I could before the bees decided to move on. Of course this was a long, three-day weekend so all the kids and their dogs were home but thankfully it was only me and the dogs at the house while all of this was going on. They still look at me funny. But at least I’m not writing this from a padded cell which I would be if the kids had been home (or the dogs could talk). Any-hoo. I managed to get dressed and find everything I needed before whipping the table-cloth off the dining room table and running out the back door to the shed where I grabbed extra hive parts which I tossed into the back of the pickup. Since the cluster was mainly on the outside of the fence I had to drive out of the yard and around to the other side of the fence. I misted them with a couple squirts of sugar-water from my handy-dandy spray bottle and right away their hum dropped down a notch as they went to work cleaning the sticky substance off each other. I snapped a few pictures and then just knelt there beside them – watching as two bees waggle-danced in the mass. I assume they were giving detailed location information for possible new housing they had found. Right then Hubby and our son, Morgan showed up so I ran to them and asked them to keep an eye on me while I tried to gather the bees – you know – for safety purposes. Needless to say they were less than thrilled and failed to see how they would be able to help if things went wrong. It appears I might be willing to run into a swarm of wild bees to save them but I’m pretty much on my own if I’m dumb enough to venture in on my own. 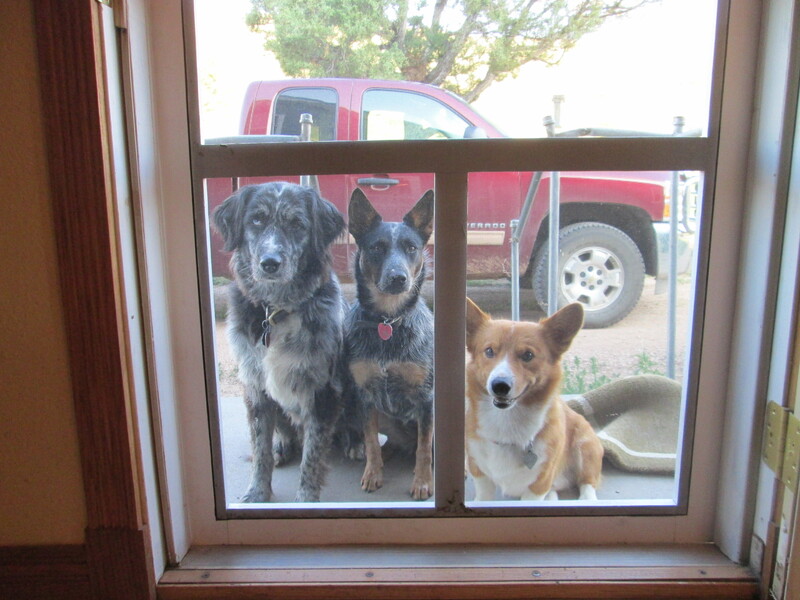 Finally, I talked them into keeping an eye on me (from a safe distance of 1/4 mile) and calling 911 if things went bad. But I shouldn’t have worried as the swarm seemed very calm. Even the one bee that found its way inside my shirt didn’t even sting me. I tucked the table-cloth over the bottom board and gave them another light spray of sugar-water then using my bee brush I swept the cluster of bees onto the cloth. Some remained on the boards but the majority of them came off in about 3 swipes. 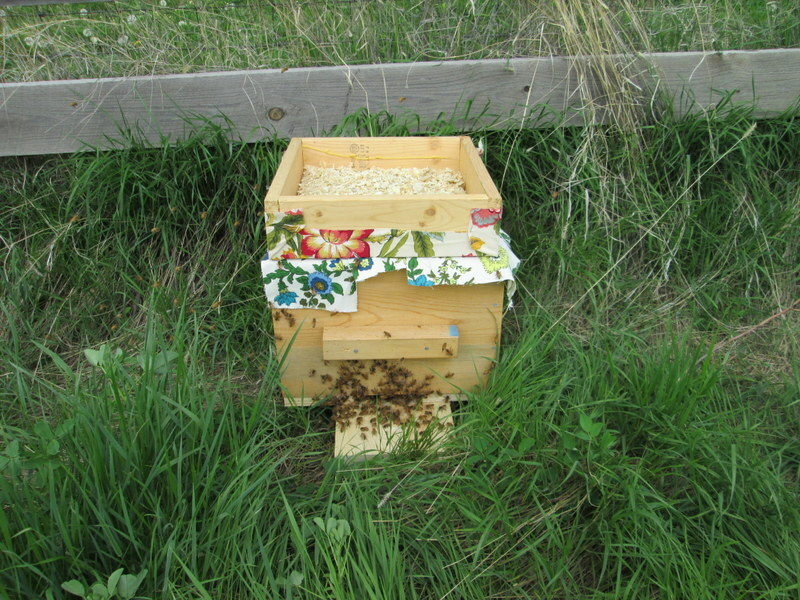 Using the cloth, I flipped the ball of bees into the box and then opened one corner so they could find their way in. Worked like a charm!!! It didn’t take them long to figure it out. 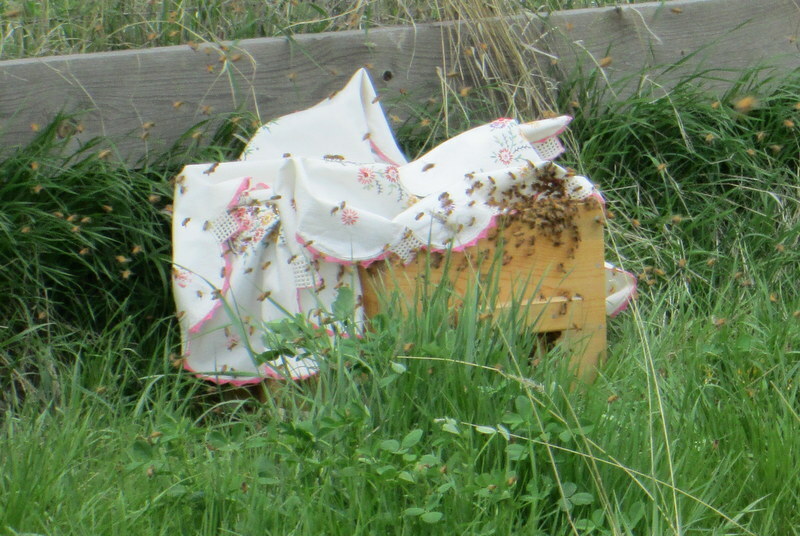 A little bit of wild, gaudy canvas and a box of sawdust on top for insulation and the bees seemed happy to move in. As it turned out it was just in the nick of time. I added the top cover as the last of the bees found the entrance & the heavens opened and rain poured down on us. Matillda and her subjects spent the night right there on the soggy ground but early the next morning I was able to move it to the other side of the greenhouse where it will probably remain. I think I should add the cover with Matillda’s name on it as this is the old queen from the original hive and I will have to come up with a name for the new queen which will hatch out shortly. Oh, what will it bee? Well, it’s official. 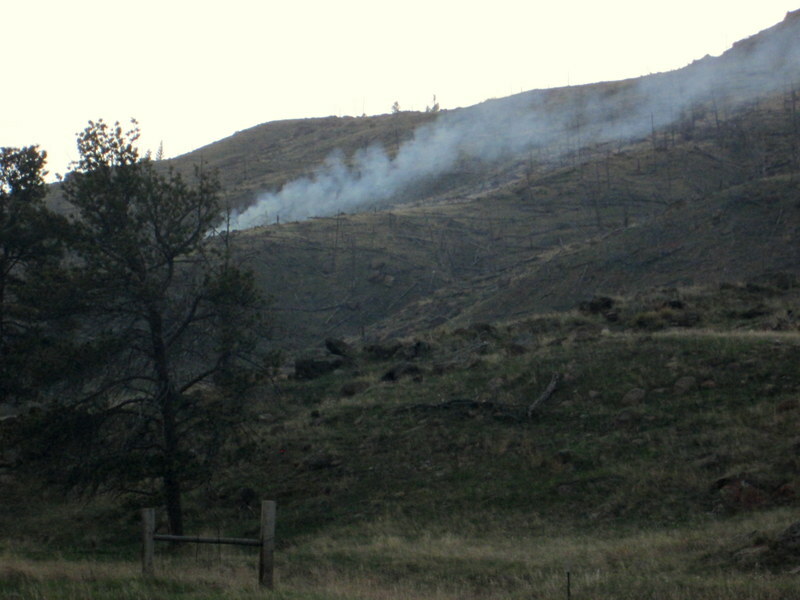 Summer must be here because the fire season has started – right in our ‘back yard’. This was the view from our front porch earlier today. We had heard the lightning hit close by but didn’t even know we were on fire until our neighbor John stopped by to let us know. I had to drive down toward my in-laws house before I could get a good look at it. 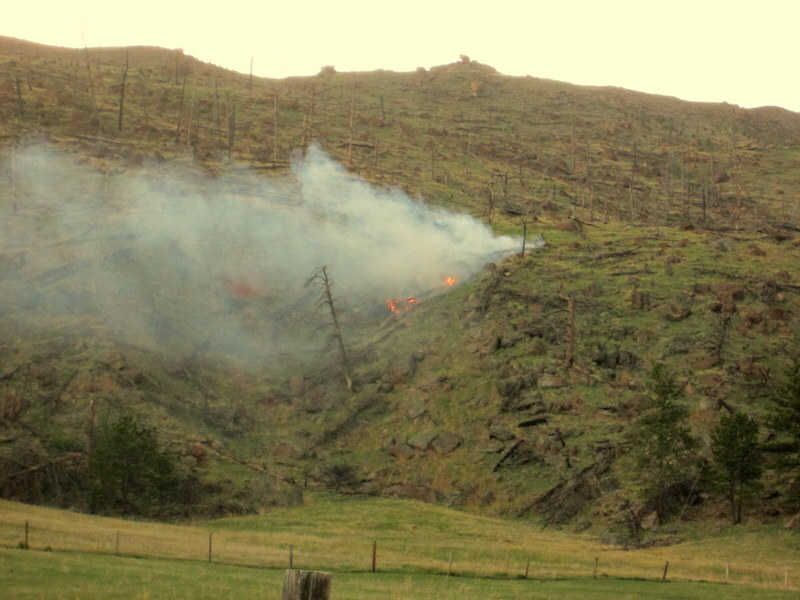 The lightning had lit up an old snag – a dead tree that had already burned once several years ago when the mountain burned off in one of the previous fires. 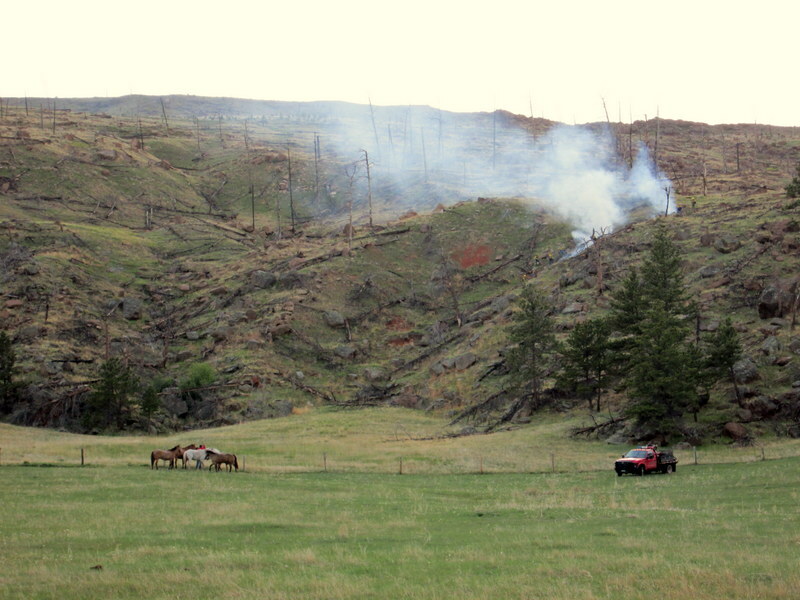 It always amazes me that Elk Mt continues to burn even though there isn’t much left to burn. Thankfully, it appears every fire department for miles around are ready and just waiting for a call. 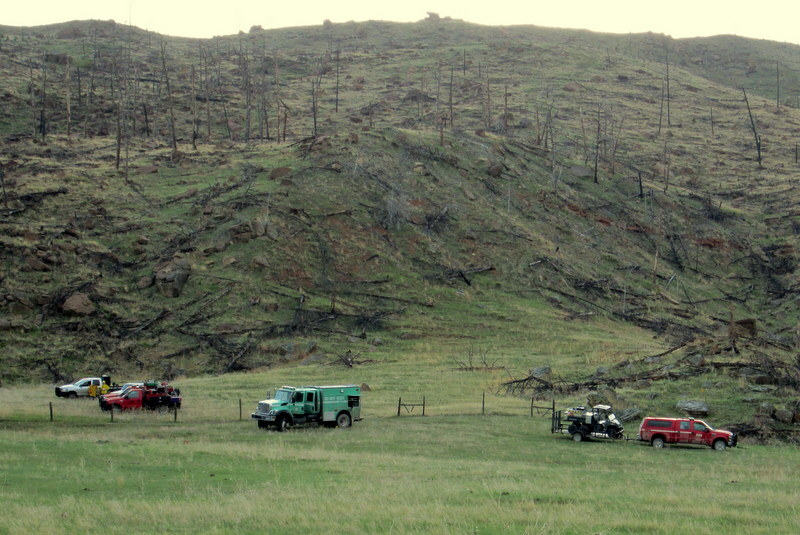 We were very lucky to have trucks and firefighters from Elk Mt Volunteer Fire Dept., the Forest Service and the Weston County Volunteer Fire Dept. – they even brought out a dozer (which I failed to get a picture of) just in case things got out of hand. 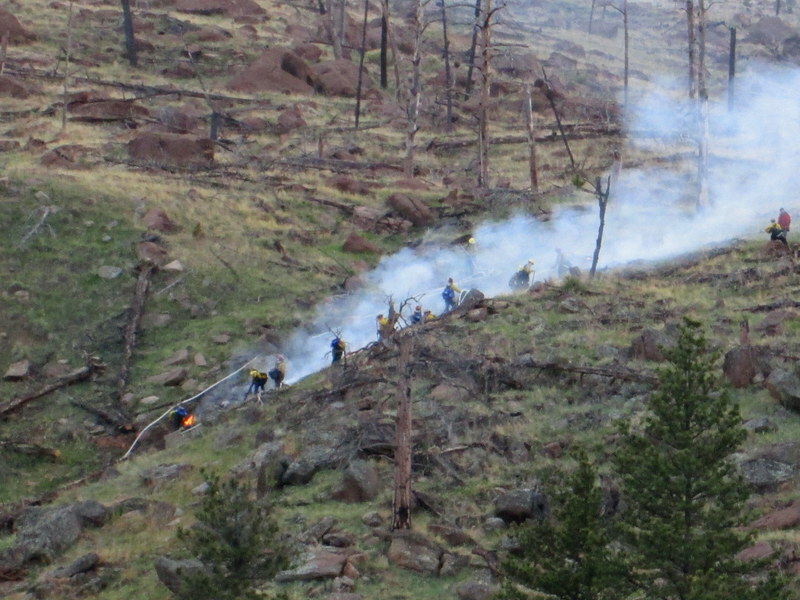 But the guys were quick to put the flames out. Even the horses were impressed. Thank you to all our friends and neighbors for coming to help. 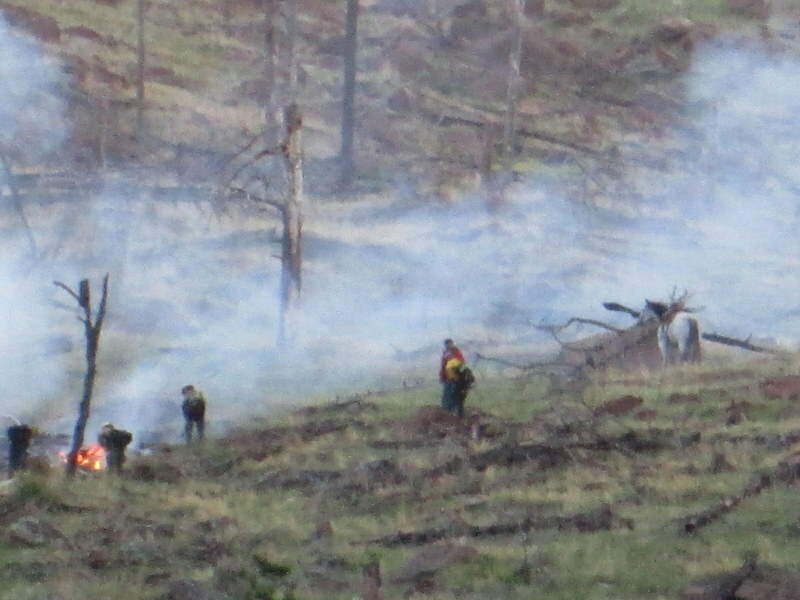 We know this isn’t the easiest country to fight fire in and we really appreciate it! That’s Hubby’s horse Smokey earning his name with a chain saw strapped to the back of his saddle.